European sports cars, American muscle cars, hot rods and customs are headed to the Newport Dunes Waterfront Resort & Marina on June 18-21. For a second year in a row, the luxurious coastal community of Newport Beach welcomes Russo and Steele, the premiere collector automotive auction, and its legendary lineup of European sports cars, American muscle cars, hot rods and customs to the Newport Dunes Waterfront Resort & Marina for a multi-million dollar sizzling summer auction featuring 400+ collectible cars June 18-21. 2013 was the inaugural event for Newport Beach, the Russo and Steele Collector Automobile Auction attracted buyers from all over the world and there’s no better backdrop than the coastal fantasyland of Newport Beach. This year, the sheer variety of classic cars and the strength of its collector car community are astounding. Southern California epitomizes the classic car lifestyle with its casually sophisticated appeal. Ranked among the “Top 10 Resort Towns in the U.S.,” Newport Beach is also dubbed one of the country’s “Top 10 Best Family Beaches.” Mild climate, beautiful coastlines, inspiring sunsets, superb golfing, world-class shopping and picturesque backdrops offer the perfect appeal to the classic car community. The Russo and Steele Newport Beach auction event will not only provide the electric atmosphere of auction in the round auction block, but also provide enthusiasts an outstanding destination to bring the whole family to experience their passion of classic cars, but also the amazing community of Newport Beach. Represented will be some of the most sought-after cars in the world. Last year’s show, for instance, witnessed the sale of a 2008 Bugati Veyron for $1,078,000. Hailed by Classic Motorsports magazine as “the best group of cars we’ve ever seen,” the Russo & Steele show is open to the general public for $20 and bidder credentials are available at registration. Russo and Steele’s dynamic collection of cars last year made a splash not only among car enthusiasts but also with the general public. Its theatrical “auction in the round” proved to be a visceral experience unlike other car shows/auctions. This year’s event will be similarly staged. 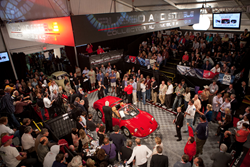 Embracing a “for enthusiasts by enthusiasts” philosophy, Russo and Steele staff are knowledgeable car fans themselves – not simply auctioneers -- so collectors appreciate having a shared passion in an environment of camaraderie. According to Andrew Alcazar, who with his wife, Josephine, own and operate Russo and Steele, last year’s event in Newport Beach proved successful for both buyers and sellers of collectible cars. A special bidder showing day will be held on Wednesday, June 18 with a charity preview and cocktail party benefit for Children’s Hospital Of Orange County (CHOC) taking place Wednesday night at 6pm. Tickets for the benefit are $150. General admission tickets can be purchased for the Friday and Saturday sessions for $20. The Auction begins on Thursday, June 19 – Saturday, June 21st and the gates open at 10am with the auction starting at noon. Make your hotel reservation at Hyatt Regency Newport Beach and mention Russo and Steele for special rates at 888.421.1442. The beautiful coastal town of Newport Beach is one of the world's most popular and versatile vacation destinations, offering romance for couples, fun for families and culture, food, shopping and sports for every aficionado. Blending the charm of Nantucket with the style of the Hamptons and idyllic weather and beaches reminiscent of a tropical resort, Newport Beach has created its own signature ambiance of laid-back luxury. Here, you'll find a unique mix of pristine white sand beaches, renowned hotels, gourmet restaurants, world-class shopping, award-winning golf, sailing, surfing and much more. Spend a weekend - or longer! - exploring tide pools, kayaking or paddle boarding, lounging at a five-star hotel pool, shopping world renowned boutiques or savoring a meal in one of our many acclaimed eateries. No matter how you customize your vacation here, we know that you'll want to return - again and again - to discover all that Newport Beach has to offer.